These spicy North African sausages are popular in Morocco, where they are grilled and served in a variety of ways--plain, with couscous, in sandwiches, with eggs or stuffed into pastries. 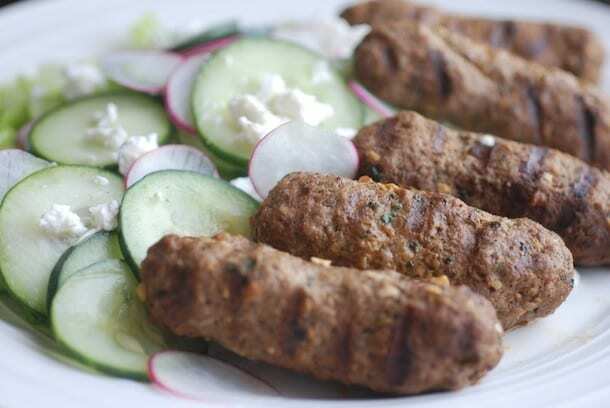 Merguez sausage can be made with ground lamb, ground beef or a mixture of the two. My favorite is an omelet with chopped tomatoes, onions, and crema fresca. To shape, roll the seasoned lamb mixture into small tubes, about 4 inches long by 1 inch wide. You can also make patties if desired. The sausage can be cooked right away, or you can wrap and freeze indefinitely. To cook, grill the sausage or cook in a skillet until cooked through.